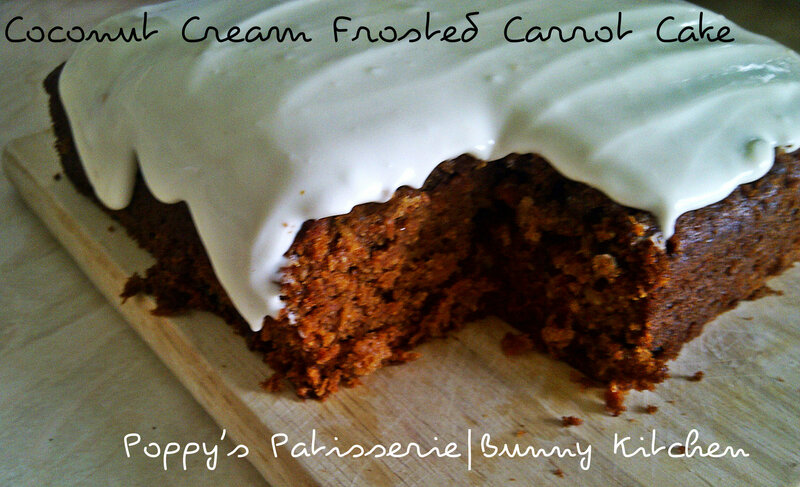 Carrot cake was the cake that led to the creation of Poppy’s Patisserie and to my passion for cooking as it is today. Food was always a part of my life growing up. My mum was/is an amazing home cook with a style of homely, traditional dishes. Much of my more traditional cooking is inspired by my mother. She always accommodated mine and my sisters’ vegetarianism without a blink of an eye despite feeding a remaining family of avid carnivores, including herself. We had my mum’s amazing ratatouille lasagne, vegetable stews and curries. Although I left my mum aged 9 (I became vegetarian aged 6) I always looked forward to visiting and to the comfort of my mums cooking. I remember spending much time in the kitchen with my mum. Watching, asking, stirring. I loved reading recipe books and had one vegetarian book (that I still have despite being a feast to the bunnies a few years ago!) that I got from a car boot sale. I would read it in bed over and over. Even as I grew up into a party hard teenager, I never went without my cookbook. My favourite childhood TV show was Ready Steady Cook and my sister and I would play as though we were competing on the show making smiley faces out of cheese sandwiches. I learnt the invaluable skill of making something out of nothing, as my mum would often be away and we’d have scarce food. Luckily for me, all the observing and question asking of my mother came in useful when I moved in with my sick dad when I was 9 and my sister 11. My sister was more the washing and cleaning daughter and I the cooking daughter. Looking back, my cooking skills were well developed for a child so young – I’d cook vegetarian spaghetti bolognese, shepherds pie and Sunday roasts. I remember my first Christmas dinner where I cooked way too much food and our plates were filled with enough to feed a family of four each! At 15 I left home and went it alone. It wasn’t a huge shock as I was already very domesticated. I first lived in a small room in a shared house. I couldn’t bring myself to use the communal kitchen so opted to get a microwave – I already had a fridge in my room. I remember really enjoying the challenge of cooking good, nutritious, vegetarian food with very little money and a microwave. I realised I could cook pasta in a bowl of water in the microwave and cook sauces in there to go with it. I made jacket potatoes, rice and noodles in my trusty microwave. In my second shared flat, I invested in a cheap mini oven so I could roast aubergines and stuffed mushrooms. By the time I rented my first flat all to myself and had the luxury of my own kitchen with a full sized electric oven, I loved lugging heavy bags of a weekly shop home on the train after college and cooking exciting meals with fresh ingredients and fun spices. Still, I was on my own and a 16 year old student so it wasn’t always pleasurable to cook up extravagant meals just for myself. I was 17 and in Ghana when I got a text on my local mobile phone from Mat. We grew up together and had been very close, his sister was/is my best friend and his family had taken care of me like their own. We’d lost touch for a couple of years. Soon after I returned home, we had hit it off and became a couple and I loved having someone to cook for. We moved to a flat together about a year later. By this time, I was increasingly passionate about food and cooking – I had acquired a collection of (mostly second hand) cookbooks bigger than any book collection I’d ever seen outside of the local library and visitors gasped at the array on my shelves. I became passionate about the source of my food, I learnt about vegetable farming practices, the use of chemicals in our foods, about air miles and corporate giants wiping out our local growers. I loved foraging berries and apples and started buying from farmer’s markets and farm shops – which was uncommon where I lived and amongst the people around me. I then started to have organic vegetable boxes delivered, around the same time I changed my attitudes towards animal products. I’d never really had much of a sweet tooth up to this point. One day, I purchased a boxed carrot cake mix and made it up. It tasted so good and I was hooked. I hated the ingredients list however and I hated the reliance on a convenience product. I wanted to be able to make it by myself, from real ingredients and not some concoction of artificial flavourings and chemicals blended with a bit of flour and called food, made by some scientist in a lab coat. Food should be created in kitchens, not laboratories, after all. I set to work, trying recipe after recipe. None of them were bad, they all tasted good, but I was determined to make a homemade carrot cake that tasted like that boxed mix. Eventually, I nailed it. 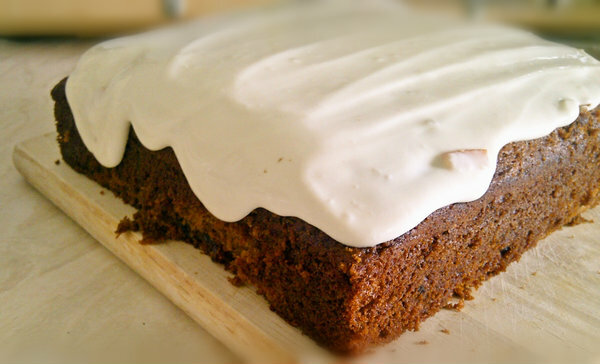 It still stands as the most incredible carrot cake ever. After this, I developed the baking bug and thrived off creating and recreating recipes. 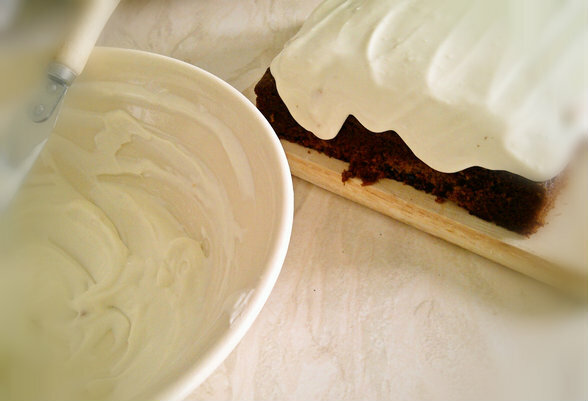 I do however, still love to try new recipes for carrot cake, especially when they have something different about them – in the case here syrup in the batter and a coconut cream frosting. Wouldn’t it be boring if we found our favourite recipes and never strayed from them? Cooking is meant to be fun and a time to experiment and try new things. 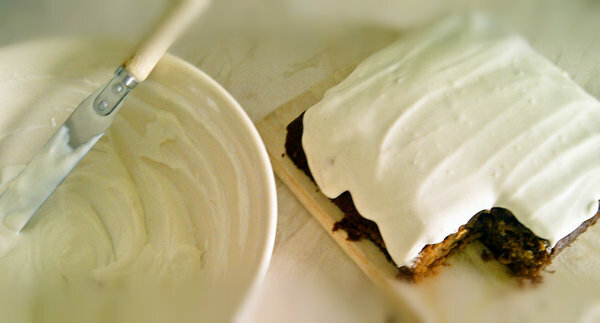 This recipe comes in a close second to my all time favourite carrot cake recipe. I have yet to eat a carrot cake that wasn’t luscious, but like a chocolate cake, no two recipes are the same – moister, fruitier, nuttier, spicier or sweeter but all delectable and delicious. Preheat oven to 160C/325F. greased and line the base of a 20cm/8inch square baking tin. In a large bowl, whisk together the oil, sugar, egg replacers and agave syrup until fully combined. 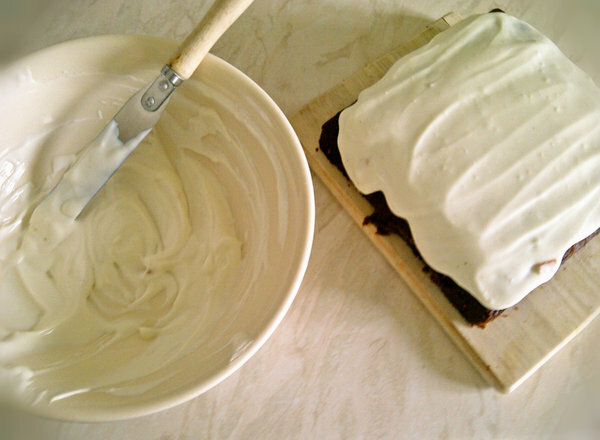 Mix in the remaining cake ingredients until combined and pour into the prepared tin. Bake in the oven for 30 minutes until risen and a skewer inserted comes out without wet batter attached. Leave the cake to cool in the tin for 10 minutes before turning out onto a wire rack to cool completely. While the cake is cooling, make the topping. Warm the marmalade in a microwave or small saucepan until melted. Beat it into the coconut cream and icing sugar. Place in the fridge before spreading over the cooled cake. This entry was posted in Cakes, Desserts, Egg-free, vegan, Vegetarian and tagged baking, cakes, dairy free, egg-free, food, recipe, vegan, vegetarian. Bookmark the permalink. Thanks Vanessa – I love the frosting! I’m going to have to try this! It looks scrumptious! Lovely post Poppy! Can’t believe you started cooking full meals at the age of 9! So lovely to know you! Ah thanks Riddhi, it is a really scrumptious cake especially the coconut frosting! It definitely helped you Poppy! Look at you now and every recipe you have put up on this blog! This sounds heavenly! It looks great! wow, doll, what a journey and determination. thumbs up for that. 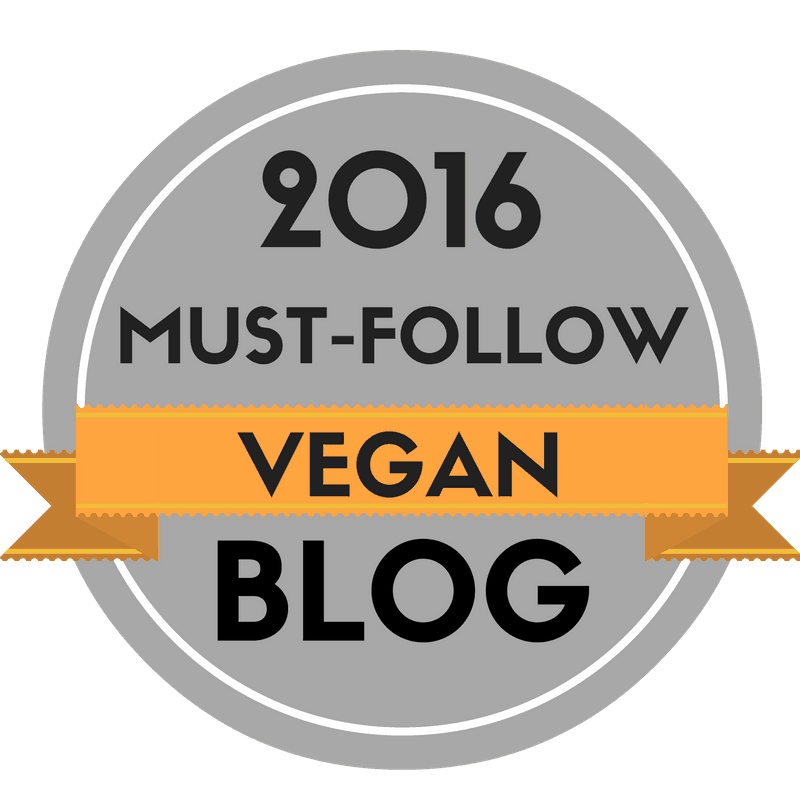 and you know, I’ve already included yours into my “best food inspiration blogs”, but now I’m thinking to make a series of vegan inspiration for those who ponder. if you like, check out the Motivation Monday series chez moi (it’s inspirational interviews each monday in june); the vegan series will be similar, but more entertaining, to get more people interested. Thanks so much for your lovely message! I will check out your Motivation Monday series – sounds interesting! Thanks for sharing both your story & your recipes! I’m an avid forager too. So many of the plants we call weeds are not only edible, but delicious and packed with nutrition. Your carrot cake looks delicious, by the way 🙂 I’d love to try that coconut frosting! Totally, it’s amazing, we just don’t know enough about the plants around us – I’m still learning but it’s fun! 🙂 The frosting is really light yet rich and creamy – I love it! I’ve long wondered how to make a whipped cream equivalent. Thank you so much! Have you seen the quote (can’t remember who it is from): “Animals are my friends, and I don’t eat my friends”? My daughter found it, and I think it sums it all up. Carrot Cake…I miss carrot cake. 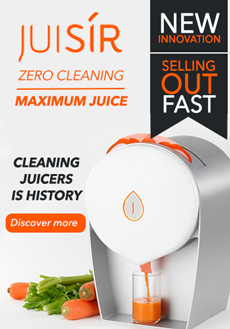 Yours looks fantastic. 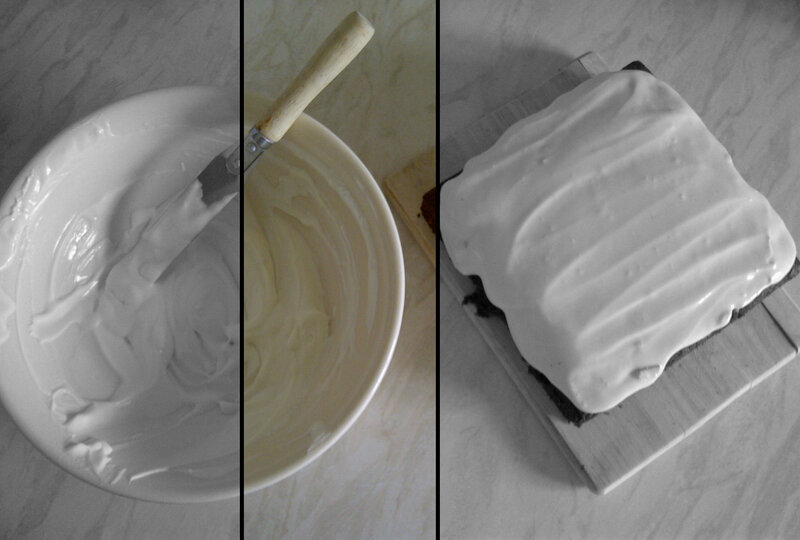 Oh that beautiful slather of icing! Thanks Annie, it really makes you want to dive in doesn’t it?! Your coconut frosting sounds so delicious! Can’t wait to try it out! Thank you, it’s my favourite frosting now so much more interesting than ‘buttercream’ and so much healthier which is a bonus! This cake sounds amazing… Thanks for stopping by my blog and liking my recent post! What a beautiful message! That really lifted my spirits, thank you so much. I really hope you try more recipes and find some you love! I’d recommend this one; the syrup makes it so moist and adds so much flavour, it’s seriously addictive!